Cover artwork: Detail from an anonymous portrait of Prince Nikolaus Esterházy ‘the Magnificent’ (1714-1790). As centuries go, the eighteenth was a pretty good one for the cello. The comparatively new instrument gained its first superstar, Francesco Alborea (1691-1739), known to his fans as Franciscello; and shortly after Franciscello had bowed out (so to speak), the greatest virtuoso cellist/composer of all, Luigi Boccherini (1743-1805) was born. In terms of composition there were some notable glories too: in the earlier part of the century the Bach suites, and towards the end the first two of Beethoven’s five sonatas. But there were also some tragically missed opportunities: nobody seems to have asked Mozart to write a major cello work (well, there may at some point have been a concerto in F—but it’s doubtful); and the hideous (though quite possibly untrue) story is told that the cellist Bernhard Romberg, a childhood friend of Beethoven’s in Bonn, refused the latter’s offer to write him a concerto, on the grounds that Romberg only played his own music. But at least we have Haydn! That is to say, we now have the two concertos presented here; but even that has not always been the case. Had we been lucky enough to be having a conversation with the noted musical scholar Herr Professor Strudel von Schnitzelburger in 1950, and yet rash enough to have mentioned two cello concertos by Haydn, he might have looked at us pityingly over his gold-rimmed spectacles and informed us, with authoritative regret, that there was no surviving cello concerto by Haydn. There might, he would perhaps have conceded, have been one in C major at one time, but alas it was lost, probably for ever. The only possible claimant to authenticity might be the ‘little’ D major concerto. As for the large-scale D major, surely we knew (he would have continued condescendingly) that this work was very obviously a composition by the cellist Antonín Kraft? For such had been the general scholarly verdict ever since the concerto was attributed to Kraft in an 1837 musical dictionary. Alas for Professor von Schnitzelburger, but satisfyingly for the rest of us, in 1951 the manuscript of the ‘big’ D major concerto was discovered in Vienna, the unambiguous words ‘di me Giuseppe Haydn’ proudly displayed on the title-page. Professor von Schnitzelburger might at that point have squirmed, and rather sulkily asserted that of course he’d only been joking about Kraft being the composer. (It is true, however, that—adding to the confusion—the version of the concerto generally played at that time was one edited, with pointless changes to both content and orchestration, by the Belgian musicologist François-Auguste Gevaert—luckily forgotten today.) Professor Schnitzelburger’s sulks would only have worsened if we had broken the news that the ‘little’ D major concerto is actually, as it turns out, by an Italian composer called Costanzi. But even Schnitzelburger (had he ever existed) would surely have been delighted with the happy discovery in Prague in 1961 of the lost C major concerto. 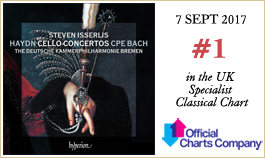 The two concertos are now the most popular of all classical cello concertos—and quite rightly so; they are both masterpieces. But how strikingly different they are from each other! I believe that their differences arose not only because of the widely separated periods of Haydn’s life at which they were composed, but also because of the distinctive strengths of the two cellists for whom they were written. We know that Haydn loved to showcase in his Esterházy compositions the skills of the resident instrumentalists; these concertos appear to be prime examples of that altruistic boasting. Another true original was Carl Philipp Emanuel Bach (C P E Bach to his present-day friends), the second surviving son of Johann Sebastian Bach. He occupies a vital—and still slightly underestimated—position in the history of music, Haydn, Mozart and even Beethoven acknowledging a huge debt to his influence. I think that part of the reason for his comparative neglect may lie in his surname. His compositions have really nothing in common with those of his father. Whereas the music of J S can be said to represent divine order, that of C P E tends more towards divine disorder, full as it is of sudden, sometimes bewildering, changes of mood and textures. 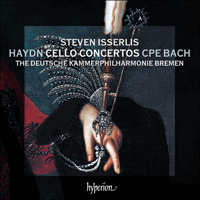 While Haydn is rightly famed for his constant experimentation, his cello concertos sound like pillars of classicism compared to the eccentricities of C P E’s Cello Concerto in A major, H439 Wq172, written in 1753. Conceived, like his other two cello concertos, as a work for cello or keyboard (C P E’s own instrument) or flute (the chosen instrument of his employer, Frederick the Great), the A major concerto never fails to surprise. As well as being a fine example of Sturm und Drang in music, the work is peppered with hidden jokes: in the first movement, for instance, the cello—despite tactful warnings from the violins—insists on beginning the recapitulation in the wrong key, D, instead of A; then, for much of the last movement, while the orchestra is playing a piece in 6/8, the cello persists in playing one in 2/4, only being converted to the orchestra’s point of view in the wild cadenza-like passages. Would Frederick and his courtiers have appreciated those subtleties of musical humour? I suspect that the answer is yes; in fact, I imagine that the day after the concerto’s premiere, the royal laundry might have included several extra pairs of trousers. The remaining two pieces recorded here owe their presence—if I may stray briefly into autobiographical territory—to an incident in my childhood. Feeling unusually brave one day, I dared myself to explore the thoroughly scary attic in my parents’ house. There I came across a large pile of 78-rpm gramophone records that had (it turned out) belonged to a music-loving great-uncle. Among them was a violin concerto played by ‘Master Yehudi Menuhin’. Thrilled at the acquisition of this treasure, I hurried downstairs to listen; and was then doubly thrilled, when I opened up the box of heavy discs, to discover that on the last record-side of the set was an extra piece for violin and piano, using up space not needed for the concerto. I eagerly leafed through the other box-sets—and discovered that many of them had these little extra treats at the end. As a direct result of this, I love to add little extras to my own recordings; and—since there was not enough space for a fourth concerto—this album provided a perfect opportunity. The ‘extras’ in question are two arias, one originally for voice, the other for cello, by Mozart and Boccherini respectively. The Mozart is Geme la tortorella, from the lovely opera La finta giardiniera, written when he was eighteen. I am usually wary of arranging vocal music for cello, because of the importance of the lost text; but in this case, I was prepared to make an exception. The aria is sung at a point when—unheard-of in an opera—the heroine is having difficulties in love; she sings about the lonely sound of the cooings of a turtle-dove. Feeling, rightly or wrongly, that this was not the most meaningful of texts, I took my courage in my hands and adapted it for cello. Au fil des siècles, il s’avère que le XVIIIe fut une assez bonne période pour le violoncelle. Cet instrument relativement nouveau connut sa première superstar, Francesco Alborea (1691-1739), appelé Franciscello par ses admirateurs; et peu après que Franciscello ait tiré sa révérence, c’est Luigi Boccherini (1743-1805) le plus grand violoncelliste virtuose et compositeur, qui vit le jour. En termes de composition, il y eut aussi quelques joyaux notables—dans la première partie du siècle, les suites de Bach et, vers la fin, les deux premières des cinq sonates de Beethoven. Par ailleurs, il y eut aussi de regrettables occasions manquées: personne ne semble avoir demandé à Mozart d’écrire une œuvre majeure pour violoncelle (bon, il se pourrait qu’il y ait eu à un moment donné un concerto en fa majeur—mais ce n’est pas certain); et l’on raconte une terrible histoire (qui n’est peut-être pas véridique) selon laquelle le violoncelliste Bernhard Romberg, ami d’enfance de Beethoven à Bonn, aurait refusé l’offre de ce dernier de lui écrire un concerto, parce que Romberg ne jouait que sa propre musique. Mais au moins nous avons Haydn! C’est-à-dire, nous avons aujourd’hui les deux concertos présentés ici; mais même cela n’a pas toujours été le cas. Si nous avions eu la chance de nous entretenir en 1950 avec le célèbre musicologue, le professeur Strudel von Schnitzelburger, et si nous avions eu l’imprudence de mentionner deux concertos pour violoncelle de Haydn, il aurait pu nous regarder avec mépris par-dessus ses lunettes à monture en or et nous informer, avec regret et autorité, qu’aucun concerto pour violoncelle de Haydn n’avait survécu. Peut-être aurait-il concédé l’existence éventuelle d’un concerto en ut majeur à une certaine époque, mais il aurait affirmé qu’hélas il était perdu, probablement à jamais. Le seul prétendant possible à l’authenticité pouvait être le «petit» concerto en ré majeur. Quant au grand concerto en ré majeur, nous savions sans l’ombre d’un doute (aurait-il poursuivi avec condescendance) que cette œuvre était de toute évidence une composition du violoncelliste Antonín Kraft. Car tel était le verdict général des spécialistes depuis que ce concerto avait été attribué à Kraft dans un dictionnaire de la musique de 1837. Hélas pour le professeur von Schnitzelburger, mais heureusement pour nous autres, le manuscrit du «grand» concerto en ré majeur fut découvert à Vienne en 1951, avec les mots sans équivoque «di me Giuseppe Haydn» bien en évidence sur la page de titre. Le professeur von Schnitzelburger aurait pu alors se sentir très mal à l’aise et affirmer d’un air boudeur qu’il ne faisait que plaisanter quand il avait dit que Kraft en était le compositeur (et il aurait fait remarquer, assez honnêtement, que la version du concerto généralement jouée à cette époque était une version éditée par le musicologue belge François-Auguste Gevaert, avec des modifications absurdes du contenu et de l’orchestration). Et sa bouderie n’aurait fait qu’empirer si nous lui avions annoncé qu’en fait le «petit» concerto en ré majeur était, en fin de compte, l’œuvre d’un compositeur italien appelé Costanzi. Néanmoins, le professeur von Schnitzelburger (s’il avait existé—et avait survécu à cette humiliation encore une dizaine d’années sans se noyer dans un tonneau de weiss Bier) aurait sûrement été ravi de l’heureuse découverte à Prague en 1961 du concerto en ut majeur, qui avait été perdu. Ces deux concertos sont maintenant de loin les concertos pour violoncelle classiques les plus populaires de tous—et vraiment à juste titre; ce sont tous deux des chefs-d’œuvre. Mais ils sont tellement différents l’un de l’autre! Je crois que les différences résultent non seulement des périodes distinctes de la vie de Haydn durant lesquelles ils furent composés, mais également des qualités spécifiques des deux violoncellistes pour qui ils furent écrits. On sait que, dans ses compositions d’Esterház, Haydn aimait mettre en valeur le talent des instrumentistes résidents; ces concertos semblent être d’excellents exemples de cette fierté altruiste. Carl Philipp Emanuel Bach (C. P. E. Bach pour ses amis actuels), le second fils survivant de Jean-Sébastien Bach, est un autre véritable original. C’est un personnage important et encore un peu négligé de l’histoire de la musique; Haydn, Mozart et même Beethoven reconnaissaient qu’ils devaient beaucoup à son influence. Je pense que la raison de cette indifférence relative est due en partie à son nom de famille. Ses compositions n’ont vraiment rien de commun avec celles de son père. Si l’on peut dire que la musique de J. S. représente l’ordre divin, celle de C. P. E. penche davantage vers le désordre divin; elle regorge de brusques changements d’atmosphère et d’émotions extrêmes. Si Haydn est célèbre à juste titre pour ses expériences constantes, ses concertos pour violoncelle font figure de piliers du classicisme par rapport aux excentricités du Concerto pour violoncelle en la majeur, H439 Wq172, de C. P. E. Bach, écrit en 1753. Conçu, comme ses deux autres concertos pour violoncelle, comme une œuvre pour violoncelle ou instrument à clavier (le propre instrument de C. P. E.) ou flûte (l’instrument de prédilection de son employeur, Frédéric le Grand), le concerto en la majeur ne manque jamais de surprendre. Tout en étant un bel exemple de Sturm und Drang en musique, cette œuvre est parsemée de plaisanteries cachées: dans le premier mouvement, par exemple, le violoncelle—malgré les mises en garde pleines de tact des violons—insiste pour commencer la réexposition dans la mauvaise tonalité, ré majeur, au lieu de la majeur; ensuite, pendant une grande partie du dernier mouvement, alors que l’orchestre joue un passage à 6/8, le violoncelle s’obstine à jouer à 2/4, ne se rangeant au point de vue de l’orchestre que dans les passages agités de cadence. Frédéric et ses courtisans appréciaient-ils ces subtilités d’humour musical? Je pense que oui; en fait, j’imagine qu’après la création de ce concerto, il dut y avoir quelques pantalons supplémentaires sur la facture de blanchisserie royale. Les deux autres œuvres enregistrées ici doivent leur présence—si je puis m’aventurer un instant sur un territoire relevant de l’autobiographie—à un incident survenu dans mon enfance. Un jour où je me sentais exceptionnellement courageux, j’ai osé explorer le grenier très angoissant de mes parents. J’y ai trouvé une grosse pile de 78 tours qui se sont avérés avoir appartenu à un grand-oncle mélomane. Parmi ces disques, il y avait un concerto pour violon joué par «Maître Yehudi Menuhin». J’étais heureux de le trouver et je suis descendu en vitesse pour l’écouter; et j’ai été deux fois plus heureux, en l’ouvrant, de découvrir que sur la dernière face de l’ensemble, il y avait une pièce supplémentaire pour violon et piano, occupant la place inutilisée par le concerto. J’ai exploré les autres albums avec enthousiasme—et j’ai découvert que plusieurs d’entre eux comportaient ces petites gâteries à la fin. C’est ce qui explique pourquoi j’aime ajouter de petits extras à mes propres enregistrements; et—comme il n’y avait pas assez de place pour un quatrième concerto—cet album en fournissait une parfaite opportunité. Les «extras» en question sont deux arias, l’une à l’origine pour voix, l’autre pour violoncelle, de Mozart et Boccherini respectivement. Celle de Mozart est Geme la tortorella, du charmant opéra La finta giardiniera, qu’il composa à l’âge de dix-huit ans. En général, j’hésite beaucoup à arranger de la musique vocale pour violoncelle, à cause de l’importance du texte; mais dans ce cas, j’étais prêt à faire une exception. Cette aria est chantée à un moment où—ce qui est sans précédent dans un opéra—l’héroïne a des difficultés en amour; son chant parle du chant solitaire des roucoulements d’une tourterelle. Jugeant, à tort ou à raison, que ce n’était pas un texte très significatif, j’ai pris mon courage à deux mains et je l’ai adapté pour le violoncelle. Luigi Boccherini est le plus doux des compositeurs représentés ici, son style intime convenant souvent mieux à une pièce qu’à une grande salle de concert. Hélas, la réputation de ses concertos pour violoncelle souffre du fait que, pendant de nombreuses années, le seul que l’on jouait fréquemment était celui en si bémol majeur—et cela uniquement dans un horrible arrangement victorien réalisé par le violoncelliste Friedrich Grützmacher, qui en fit quelque chose de méconnaissable. L’un de ses innombrables changements majeurs (et tout à fait inutiles) fut de remplacer le mouvement lent original de ce concerto par celui enregistré ici, ce qui au moins est compréhensible dans la mesure où cet Adagio est un véritable bijou. L’une des caractéristiques les plus frappantes de ce concerto, et d’autres concertos de Boccherini, est l’orchestration dans les passages solo, où l’accompagnement se limite aux violons et à l’alto ou, comme ici, aux violons seuls. Il y a peut-être une explication pratique si Boccherini était le seul violoncelliste disponible pour jouer la basse dans les tutti; mais je crois que l’effet qu’il recherchait en réduisant l’accompagnement à une telle texture en filigrane était de créer une impression de délicatesse divine. Et je crois—et espère que vous en conviendrez—qu’il y parvient parfaitement. Wenn man die Musikgeschichte gerne nach Jahrhunderten einteilt, dann war dass achtzehnte für das Cello ein besonders gutes. Das vergleichsweise junge Instrument bekam seinen ersten Superstar: Francesco Alborea (1691-1739), genannt Franciscello. Und kurz nachdem dieser, bildlich gesprochen, seine letzte Verbeugung getan hatte, wurde der größte Virtuose und Komponist des Cellos überhaupt geboren: Luigi Boccherini (1743-1805). Auch in puncto Kompositionen weist das Jahrhundert einige Glanzlichter auf: in den frühen Jahren des Jahrhunderts die Suiten Bachs, an seinem Ende die ersten beiden der insgesamt fünf Beethoven-Sonaten. Doch gab es auch ein paar verpasste Gelegenheiten. So scheint niemand ein größeres Cello-Werk bei Mozart bestellt zu haben (möglicherweise gab es da mal ein F-Dur-Konzert, doch das ist unsicher); und dann kursiert noch die furchtbare, wenn auch wohl unwahre Geschichte, dass der Cellist Bernhard Romberg, ein Jugendfreund Beethovens, dessen Angebot, ihm ein Konzert zu komponieren, ausgeschlagen habe; er spiele ausschließlich seine eigene Musik. Aber immerhin haben wir doch Haydn! Genauer gesagt: Heute liegen uns die beiden hier eingespielten Konzerte vor—das war nicht immer so. Denn hätte es uns das Schicksal beschieden, uns 1950 mit dem berühmten Musikgelehrten Herrn Professor Strudel von Schnitzelburger zu unterhalten, und wären wir dabei so voreilig gewesen, zwei Cellokonzerte von Haydn zu erwähnen—der Professor hätte uns mitleidig über den Goldrand seiner Brille gemustert und uns, mit ebenso hoher Fachkenntnis wie tiefem Bedauern mitgeteilt, dass sich kein Cellokonzert Haydns erhalten habe. Es habe da, hätte er womöglich eingeräumt, einst eines in C-Dur gegeben, doch das sei wohl auf immer verschollen. Einzig das „Kleine“ D-Dur-Konzert könne Anspruch auf Echtheit erheben. Was aber das „Große“ in D-Dur betreffe, so wüssten wir doch ganz bestimmt—so der Professor weiter—, dass es ganz offensichtlich ein Werk des Cellisten Antonín Kraft sei? Denn so lautete das Urteil der Gelehrten, seitdem das Konzert 1837 in einem Musiklexikon Kraft zugeschrieben worden war. Zum Glück für uns jedoch—und zum Unglück für Professor Schnitzelburger—wurde 1951 in Wien das Autograph des „großen“ D-Dur-Konzerts entdeckt, und auf seiner Titelseite prangten unverkennbar die Worte „di me Giuseppe Haydn“. Der Herr Professor hätte sich dann wohl gewunden und etwas mürrisch zugegeben, dass er es, was die Autorschaft Krafts anging, natürlich nicht ganz ernst gemeint habe (und mit Recht darauf hingewiesen, dass die damals gängige Fassung des Konzerts in Satz und Instrumentierung ebenso zahlreiche wie sinnlose Änderungen des belgischen Musikwissenschaftlers François-Auguste Gevaert enthielt). Und seine Laune hätte sich weiter verdüstert, wenn wir ihm eröffnet hätten, dass das „Kleine“ D-Dur-Konzert sich tatsächlich als Werk eines Italieners namens Costanzi entpuppt hätte. Doch selbst Professor von Schnitzelburger hätte sich—wenn es ihn denn gegeben, er die Demütigung verwunden und sich darob nicht in einem Fass Weißbier ertränkt hätte—darüber gefreut, dass 1961 in Prag das bis dato verschollene C-Dur-Konzert entdeckt wurde. Die beiden Konzerte sind mit Abstand die berühmtesten aller klassischen Cellokonzerte—mit Recht, denn beide sind wahre Meisterwerke. Doch wie verschieden sind sie! Ihre Unterschiede ergeben sich meiner Ansicht nach nicht nur daraus, dass sie verschiedenen Schaffensphasen Haydns angehören, sondern auch aus den jeweiligen Stärken der beiden Cellisten, für die sie geschrieben wurden. Wir wissen, wie gern Haydn in Esterházy die Qualitäten seiner Musikerkollegen in seinen Kompositionen herausstellte; diese beiden Konzerte sind offenbar Musterbeispiele für dieses Renommieren im Namen anderer. Ein ebensolches Originalgenie war Carl Philipp Emanuel Bach (oder C. Ph. E. Bach, wie ihn seine Freunde heute nennen), der zweite überlebende Sohn Johann Sebastian Bachs—eine bedeutende, noch immer etwas im Schatten stehende Figur der Musikgeschichte, der sich Haydn, Mozart und sogar Beethoven, wie sie bekannten, zutiefst verpflichtet sahen. Dass wir ihn heute oft so vernachlässigen, hat, glaube ich, mit seinem Nachnamen zu tun. Seine Kompositionen haben mit denen seines Vaters so überhaupt nichts gemein. Denn wenn man sagen kann, J. S. Bachs Musik stehe für die göttliche Ordnung, so neigt die C. Ph. E. Bachs mit ihren ständigen Stimmungsumschwüngen und extremen Emotionen zu göttlicher Unordnung. Und wenn man Haydn für seine Experimentierfreude rühmt, so klingen dessen Cellokonzerte wie der Inbegriff von Klassizität im Vergleich mit den Launen von C. Ph. E. Bachs Cellokonzert A-Dur, H439 Wq172, komponiert 1753. Geschrieben wurde es als Werk für Cello oder Tasteninstrument (das er selber spielte) oder Flöte (das Instrument seines Dienstherrn Friedrich des Großen)—und es sorgt unfehlbar für Überraschungen. Denn es ist nicht bloß ein glanzvolles Beispiel für Sturm und Drang in der Musik, sondern außerdem mit verstecktem Humor gewürzt: So besteht in der Reprise des ersten Satzes das Cello, den höflichen Warnungen der Geigen zum Trotz, auf der falschen Tonart, nämlich auf D- statt A-Dur; und im letzten Satz spielt das Orchester ein Stück im 6/8-Takt, während das Cello trotzig auf einem im 2/4-Takt beharrt. Dem Standpunkt des Orchesters schließt es sich erst in den wilden Passagen der Kadenz an. Ob wohl Friedrich und seine Höflinge die Feinheiten dieses musikalischen Humors begriffen? Ich halte das für möglich und würde sogar soweit gehen, das man sich höchstderoselbst darüber kaputtlachte. Die verbleibenden zwei Stücke verdanken ihren Platz auf dieser Einspielung—wenn ich kurz ins Autobiografische abschweifen darf—einem Kindheitserlebnis. Als ich mich eines Tages besonders wagemutig fühlte, traute ich mich, den durch und durch gruseligen Dachboden meines Elternhauses zu erkunden. Dort stieß ich auf einen großen Stapel Schellackplatten, die, wie sich herausstellte, einem musikliebenden Großonkel gehört hatten. Darunter war auch ein Violinkonzert mit Yehudi Menuhin als Solist. Ich freute mich darüber und lief eilig nach unten, um es anzuhören; noch mehr freute ich mich aber, als ich entdeckte, dass die letzte Plattenseite des Sets, die für das Konzert nicht gebraucht wurde, ein weiteres Stück für Violine und Klavier enthielt. Daraufhin ging ich neugierig die übrigen Schuber durch und entdeckte, dass viele diese kleinen Bonbons am Ende besaßen. So kommt es, dass ich gerne an meine eigenen Aufnahmen eine kleine Zugabe hänge; und weil für ein viertes Cellokonzert nicht genug Platz war, bot dieses Album die perfekte Gelegenheit dazu. Hier bestehen die Zugaben aus zwei Arien: eine von Mozart für Singstimme, eine von Boccherini für das Cello. Bei der Mozart-Arie handelt es sich um um Geme la tortorella aus der hübschen Oper La finta giardiniera, die Mozart als Achtzehnjähriger schrieb. Beim Arrangieren von Vokalmusik bin ich normalerweise vorsichtig, weil der Text so wichtig ist; in diesem Fall war ich aber bereit, eine Ausnahme zu machen. Die Arie erklingt an einer Stelle der Oper, an der die Heldin sich mit der Liebe schwer tut—so etwas hatte es auf der Opernbühne noch nicht gegeben. Sie besingt das einsame Gurren der Turteltaube. Auf diesen Text, so sagte ich mir—ob nun zu Recht oder nicht—, kam es nicht so sehr an, und so fasste ich Mut und bearbeitete die Arie für Cello. Von den hier vertretenen Komponisten ist Luigi Boccherini der sanfteste; sein intimer Stil passt oft besser in die Kammer als in der Konzertsaal. Leider hat der Ruf seiner Cellokonzerte darunter gelitten, dass über Jahre das B-Dur-Konzert das einzige war, das häufiger gespielt wurde—und überdies in einer unschönen viktorianischen Bearbeitung des Cellisten Friedrich Grützmacher, die das Konzert bis zur Unkenntlichkeit entstellte. Zu dessen vielen (unnötigen) Eingriffen zählt das Ersetzen des ursprünglichen langsamen Satzes durch jenen, der hier eingespielt wurde. Hier zumindest kann man Verständnis aufbringen, denn dieses Adagio ist ein wahres Juwel. Eine der auffälligsten Eigenschaften dieses und anderer Boccherini-Konzerte ist die Instrumentierung in den Solopassagen, die sich auf Violinen und Bratschen oder, wie hier, auf Violinen allein beschränkt. Vielleicht hatte das praktische Gründe, etwa dass Boccherini der einzige Cellist war, der im Tutti dann auch die Bassstimme übernehmen musste; doch glaube ich, dass dieses Ausdünnen auf einen so filigranen Satz darauf abzielt, den Eindruck von himmlischer Zartheit zu erzeugen. Und ich glaube—in der Hoffnung auf Ihre Zustimmung—, dass ihm das auf Schönste geglückt ist.